A group of interested citizens met at the historic John McKenzie house at 34 Parkview Avenue in North York to decide what use could be made of the vacant city lot next door at 44 Parkview. Toronto Councillor John Filion and Executive Director Rob Leverty (Ontario Historical Society) hosted the meeting at which time, after much consideration, a decision was made that an organic market garden could be created and operated by volunteers. Thus the garden has evolved into its fourth year of operation successfully growing lush produce, some of which is shared with those in need and some sold with profits donated to worthy causes, at the end of the growing season. Variety describes the character of the garden. This is borne out in our volunteers who have come from many countries and willingly share their cultural gardening traditions. Community members contribute their skills e.g., building wooden plant climbing structures, construction of a market garden wagon, installation of bee houses for research purposes, designing and planting a flower garden, storytelling via garden tours etc. Produce includes many kinds of vegetables, herbs and fruit grown using up-to-date organic practices. Native flower species are planted to entice and serve bees and butterflies for our mutual benefit given the work they do to ensure our fruitful produce. Available for our use is a stable for supplies and tools and an old hand-operated water pump. This is our 21st century version of ‘back to the farm”. But what was happening on this land from the 18th century onward? What did the site of the PNG look like in 1797? Imagine a land forested with sugar maple, beech and hemlock. Imagine the first settlers, having received a 200-acre land grant, who saw only a potential farm, a plot of land to grow crops on, but which was covered with trees that stood in their way of survival. 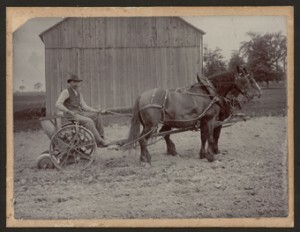 Once the land was cleared it became known as a ‘farm’.The Jacob Cummer and Lawrence Johnson families, being the first pioneers, settled on land spaning from Finch Avenue to Park Home Avenue and along both sides of Yonge Street in 1797. By 1798 four log houses had been built with about twelve acres of land cleared on each lot. Examples of trades that existed from 1799 to1878 included blacksmiths, builders, carpenters,shoemakers,wagon makers, well diggers,tanners, dress makers, potters,distillers etc. Cummer’s settlement became known from 1855 as Willowdale, named after some willows that existed near the Willowdale Post Office opened by David Gibson in 1855. Jacob Cummer was the first Postmaster. What happened on the PNG site from 1884 to 1915? A portion of the original farm was sold by Cummer’s heirs to Philip McKenzie, a carpenter and casket-maker by trade. 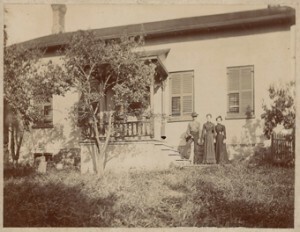 McKenzie and his family lived in the old Cummer farmhouse, a one-and-a half storey Georgian brick-style dwelling. The house built in 1840s or 1850s faced Yonge Street and was located between Parkview and Norton Avenues. On Phillip’s death his son John farmed the land, specializing in Holstein cattle.When local conditions for agriculture began to deteriorate McKenzie decided to subdivide the farm for suburban residential development. The ‘Empress Subdivision” was registered in October 1912. In 1913 McKenzie built a new brick house to replace the earlier farmhouse on a large lot on the rise of land on Parkview Avenue at the head of Doris Avenue. It was and is an imposing structure combining Queen Anne Revival details with Arts and Crafts form to include 12 rooms and 3 bathrooms. A strip of land was retained to allow room for two Jersey cows to graze. At the rear of the house the brick milkhouse (1907) and the brick stable (1915) served the scaled-down agricultural practices of the household after the creation of the subdivision. Surrounded by vestiges of the original farm namely, the family home, the milkhouse, the stable, even an unearthed horse shoe, we have achieved much. We donated $500. to local food banks; conducted workshops on seed saving and viability, planting and watering; planted fruit and nut trees; wrote an article for publication in Our Canada magazine; hosted tours including an ESL tour in Farsi; translated signage into 4 languages; partnered with schools and community groups such as McKee Preschool, McKee Summer Arts Campers, North York Garden Club and exchanged services and expertise with Spadina House gardens. There are many heart-warming stories yet to tell about the wonderful interactions among the volunteers and with our various communities and even about wildlife visitors to the garden. More to come. Volunteers from many nations work in the garden to nurture plants to maturity. This means that not only the local community can enjoy healthy produce but others further afield who do not have access to such bounty. Funds are raised through sales during the growing season and are donated to worthy causes. Produce is also distributed mid season. But, where to display and sell these goods. Vegetables, herbs and fruit grew well, so we determined that we needed a cart. Building on a design created by a friend in Winnipeg, we adapted it to the size that would fit through our stable door. Having contacted the Trades Council of the Toronto District School Board, we found interested staff and students who were eager to build the cart. This project proved to be a valuable learning experience for these students. So Iqbal Ali, Eliot Asamoah, Antonio Bell, Malcolm Jones, Sarim Sem, Steefon Thom and Fitzgerald Thomas began work in March 2010 under the guidance of instructors Gilbert and Patrick. It was wonderful to watch the instructors’ pride as they guided their students in the construction of a sturdy cart which has since been put to good use. 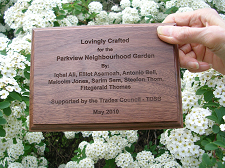 We celebrated their work when they arrived at the garden to install its various parts. Being healthy teenagers we knew we should feed them and so we did. We gave each a personal photo album showing the various stages of their work and some of our produce. Included as well were our words of thanks. We gave them a tour of the garden where they enjoyed seeing the stages of a blooming strawberry, learning the progression from pink flower to red berry. We introduced them to lemon balm and gave them springs for their albums. Later, this group of fellows gave us a welcome surprise. Our visitors brought us three wooden trugs they had made in their school’s carpentry department. One young boy also made a small bird feeder of found materials. These boys and their instructors have given us such warm memories that endure each time we use the cart and the trugs. April and May Work Projects – Come Join Us!